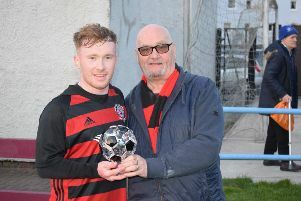 Rob Roy’s season came to a lacklustre end as they went out of the Central League Cup to lower league St Anthony’s last Wednesday. In what was at time a fiery quarter-final encounter the referee issued 10 cautions, two red cards and sent both the Ants manager and his assistant from the technical area. Rabs started brightly and in the first minute Willie Sawyers’ effort was blocked by the feet of Ants keeper Jack Baker. A minute later Chris Duff headed the wide ball from inside the penalty box. But the Kirkintilloch side Rabs were unable to transfer their early authority into goals and it was the visitors who got the scoring under way in the eighth minute when Brian Henderson took advantage of a defensive error by Jon Carter to crash the ball past home ’keeper Jon Murdoch. Rabs had the bulk of possession but rarely looked like creating clearcut chances, although Kevin Watt should have done better when in front of goal but could only partly hit his shot and it failed to trouble Baker. St Anthony’s extended their lead in the 38th minute when Kyle Brown connected with a low cross from the right to slot the ball past Murdoch from close range. Rabs replied with David Barr rising to head a Gary McMenamin free-kick towards goal only for Baker to make a fine save. This was McMenamin’s final action as he limped off to be replaced by Gavin Mackie. Kieron Maxwell should have added a third for the Ants minutes after the break but, when through on goal, his effort hit Murdoch’s outstretched leg. Sawyers had the ball in the net but was ruled offside. However the Rabs striker did pull a goal back in the 54th minute when he pounced on a Duff cross to send a low shot into the net. Baker then made another good save from Barbour as Rabs looked for the equaliser. In the 62nd minute the McKenna Park side were reduced to 10 men when Aiden Lennox picked up a second booking and was sent off. In the final period of the game Rabs were well marshalled by the Ants defence. They did have a late chance but from a Jordan McGuire cross Carter sent a volley well over the bar and at the other end Murdoch did well to punch clear a dangerous Dean McKay free-kick. In the first minute of the seven added on, Baker brilliantly pushed over the bar a 20 yard free-kick from Mackie. Deep into stoppage time Graeme Barbour who had been booked two minutes earlier, was sent off for simulation as Rabs appealed in vain for a spot kick.